Hazrat Khalifatul Masih said he recently received a letter from USA in which an Ahmadi wrote how he was inspired to listen to Huzoor’s address at Jalsa Salana UK about people coming into the fold of Ahmadiyyat. Huzoor had explained in the address how people were entering Ahmadiyyat Islam through Tabligh efforts and also by directly drawn to Ahmadiyyat by God through dreams etc. and how faith was being strengthened and the truthfulness of Ahmadiyyat was being instilled in hearts. This inspired the letter-writer to wish for someone to come into Ahmadiyyat through him so that he could personally witness Divine signs. A short while later he received a telephone call from a lady who said that she had seen his number on our web site. She said she was interested in Islam and wished to meet. On being invited she travelled a long distance and came for the meeting and related her story. She said she developed interest in Islam and started researching it on the internet. Her husband and in-laws who were strict Christians were unhappy about this and eventually there was a break-up and separation. The court gave custody of her two children to the husband. The lady gave precedence to her quest for the truth and started deep study of our web site and also started watching MTA regularly. She said the information of other sects of Islam did not satisfy her. She continued her search and also watched Jalsa proceedings and now wishes to join the Jama’at. The letter-writer said that his daughter said that when she had heard at Jalsa how new-comers to Ahmadiyyat Islam came to believe in the truth and how God guided them she had felt that perhaps those were exaggerated accounts. But listening to this lady her faith was refreshed and now she understood how God truly guides people to the truth. Some educated people as well as young people may wonder if the accounts of new-comers to Ahmadiyyat are somewhat overstated. It should be remembered that what Huzoor presents are not mere stories but are factual accounts and are instances of a Divine wave. There are indeed countless such accounts from which Huzoor but chooses a few. Huzoor said he had said last year that he would relate some of these accounts [apart from at Jalsa Salana] during the course of the year as well. Now, this year’s accounts are also piling up, therefore, today Huzoor related some. This is done so that our faith is strengthened and we are motivated to self-reflect and think how we too can receive guidance from God. Accounts of new Ahmadis should not be listened to as interesting stories; these are factual accounts which should be faith-enhancing and we should be grateful to God for His treatment of the Jama’at. These accounts should inspire us to be mindful of our responsibilities. Indeed, it is our obligation to take the message of Islam Ahmadiyyat to others and while we need to make efforts for this we also need to look at our own practices and adapt them according to ways of God. Our good, positive role models will further strengthen the faith of new Ahmadis. A lady from Tunisia says that she likes reading and started a study of the Holy Qur’an and read other Islamic books. She reflected over verse 158 of Surah An Nisa: ‘… wherein they slew him not, nor crucified him but he was made to appear to them like one crucified;’ and was also drawn to other Quranic verses about death of Jesus (on whom be peace). She read in a compilation of Ahadith about the attributes of Dajjal and wondered how God could send such a person in the Muslim Ummah! She prayed to God for guidance and one day while channel surfing she found MTA. She found MTA completely opposite to other channels and felt that its discussions were carried out with dignity. Through MTA she realised that the Promised Messiah’s advent had taken place. She prayed to God not to let death overtake her until she became an Ahmadi Muslim. With the grace of God the lady has now taken Bai’at. An Ahmadi from Yemen says he lived in Chinese society and found Chinese people very good. Some Arabs took undue advantages of the good natured Chinese and he wondered how could it be these courteous people would go to Hell in spite of their gentle nature and Arabs, all but Muslim in name would go to Paradise. He started researching Islam and one day unexpectedly happened to see MTA. He found the arguments put forward on MTA very powerful and awe-inspiring and was overwhelmed by them. He started to watch MTA regularly and would always weep when watching it but did not know why he wept. He prayed abundantly that the truthfulness of the Promised Messiah (on whom be peace) would be made evident to him. During prayer his body would quiver and then he would feel tranquillity. He felt this to be answer to his search. He read books of the Promised Messiah (on whom be peace) and found most of the answers to his questions in them. He took Bai’at. A 22 year old young man from Holland says that he was always interested in spirituality but was not drawn to religion. He realised that evil was spreading rapidly in the world and this led him to study the objective of life. During his research his heart became inclined to Islam. He also had the chance to hold discussions with two Ahmadi friends of his. He visited the Jama’at, liked its atmosphere and it became evident to him that Ahmadiyyat indeed was true Islam and it also became evident to him that the Promised Messiah (on whom be peace) had come to the world. He felt there was true faith and unity among the Ahmadis. He wrote a letter to Hazrat Khalifatul Masih requesting him to pray for him and this led him to take Bai’at. He says he is now learning Salat and is trying to lead a pure life. Sadr Jama’at Kyrgyzstan says he happened to talk to a Russian colleague at work who was a Christian. She said she was not completely satisfied with her faith. She was given ‘Philosophy of the Teachings of Islam’ to read. After reading the book the lady said she felt satisfied. She read more books which further strengthened her faith. She also visited Qadian and has also taken Bai’at and is now a member of the Wasiyyat scheme. A friend from Holland says he longed to have a connection with God and also longed for love of God but Bible did not truly guide him. One day he prayed most earnestly before leaving home for the fulfilment of his wish and for him to meet someone who would help him with his search. That day was the birthday of the King when people set up stalls all over. He stumbled upon an Ahmadi stall and saw the books and literature there including the book ‘Philosophy of the Teaching of Islam’. He says after the reading the book his world was transformed and he realised the author of the book could not be someone ordinary and had indeed been Divinely bestowed with knowledge. This led him to attend Jalsa in Holland which had a profound effect on him and he realised the prayer he made that day had been fulfilled. He took Bai’at during Jalsa Salana Germany. A lady from Libya says after Qaddafi’s regime was toppled she prayed most earnestly and passionately to God to send Imam Mahdi. One day she found MTA channel on television by chance and saw a photograph of the Promised Messiah (on whom be peace) and her heart was drawn to it. She watched other MTA programmes and was informed of facts. This carried on for a year and then she felt that she should take Bai’at without further delay. She has written to Huzoor for strength of faith. A driver of one of our mission houses writes that he had been married for two years but did not have any children. He had heard about Ahmadiyyat and also about the advent of the Promised Messiah (on whom be peace). He prayed to God that if Imam Mahdi had truly come then he be blessed with a child and may he also become a follower of the Promised Messiah. His prayer was accepted. His wife fell pregnant the same month. He now has a daughter and has taken Bai’at. Hazrat Khalifatul Masih said if for some reason some people do not get satisfaction but are eager to recognise the truth they should supplicate to God with an open mind. Indeed, God guides those whose intention is good, sometimes through dreams and at other times through different means. Amir Sahib Gambia writes that a friend told him that he liked the message of the Jama’at and also appreciated that members of the Jama’at were good moral people yet he wondered why all religious leader opposed the Jama’at, surely, they could not all be wrong! Eventually he left the matter in God’s hands. He saw a dream where the Holy Prophet (peace and blessings of Allah be on him) says to him, ‘come with me’ – he sees there are other people present as well. They cross a desert and then he recognises some people there as Ahmadis. He said truthfulness of Ahmadiyyat was clear to him after this dream and he took Bai’at and now he does Tabligh and many have joined Ahmadiyyat through him. Our missionary from Haiti writes that a new Ahmadi told him that when he was researching the Jama’at he had a dream. It is an extraordinarily bright day and the sun is shining brilliantly from very close. A strong earthquake takes place in which part of his house is also destroyed. Still in the dream he thinks about visiting the Ahmadiyya mission house. As he walks to it he sees destruction all around. Upon reaching the mission house he sees that it is completely intact and the missionary is talking to some people. The missionary invites him to the sea port. There they board a white boat and sail in the sea. Following this dream he was convinced that salvation was only through Ahmadiyyat Islam and he took Bai’at. Our missionary from Australia writes that a Sikh who was under Tabligh accepted Ahmadiyyat Islam through a dream. Missionary Sahib received a telephone call from him sounding very emotional and hardly able to speak. He then related his dream of three days ago. He saw that he is a very dark place and is feeling suffocated and very anxious. Suddenly there is light and a holy person standing in front of him says if you wish to get out of the darkness hold my hand. He held the holy person’s hand and at this point he woke up! Missionary Sahib invited him over and when he showed him photographs of the Promised Messiah (on whom be peace) and the Khulafa, the person put his finger on the photo of the Promised Messiah (on whom be peace) recognising him as the holy person who had appeared in his dream. Our missionary from Mali writes that a person rang the Ahmadiyya mission house and said that he was an Ahmadi from that day and requested that his Bai’at was taken. When he was asked why he wanted to take Bai’at he said due to the current state of Muslims in the world he did not feel inclined to join any of the sects. He said he read the Qur’an and hadith and tried to follow it to the best of his ability and was convinced that God would not leave Islam in the current state and would definitely send Imam Mahdi. He prayed for this. The night before when after praying he went to sleep he had a dream in which the moon comes down from the sky and towards the Earth. So much so that it lands on the person’s hand and from it comes the sound that Imam Mahdi has come. The person then remarked: is that not what the Ahmadiyya radio broadcasts and calls on people and tells him that Messiah has come, indeed, the Messiah has come! He added, he had no doubt left in his mind and took Bai’at. A person from Conakry, Guinea says that the Ahmadiyya missionary was doing Tabligh to him but he did not have inner peace. He constantly prayed to God to show him the right path. He was shown in a dream that the path he was being invited to was indeed the right and straight path. He took Bai’at. A person from Germany writes that after being introduced to the Jama’at he started watching MTA and prayed for the truthfulness of the Promised Messiah (on whom be peace) and performed Istikhara Prayer. One night when he fell asleep after Istikhara Prayer he had a dream. He saw the Promised Messiah (on whom be peace) coming out of his palace while beams of light are emitting from the walls of the palace. The Promised Messiah (on whom be peace) opens his hands and places them on the person’s head who submits: I hear and I obey. When waking from his dream he had conviction of heart. A person writes from Egypt that he is a young Egyptian who was introduced to the Jama’at a year ago through MTA and was convinced that this indeed was the truthful sect of Islam and requested that his Bai’at was accepted. One night he prayed in a heart-rending manner for steadfastness and for a sign. He saw a dream in which he is in an assembly where he sees Huzoor Anwer and Huzoor puts a silver ring which has a Quranic inscription on it on his finger. He writes that he was elated when he woke up from this dream. Our missionary from Sierra Leone writes that there was just one Ahmadi Jama’at in a far flung place in Kanama region. In the adjoining village to where the Jama’at is established a young man of good morals was being crowned according to local tradition. The young man says the night when he was crowned he had a dream. He saw that there is a small mosque and a large mosque and he wishes to go to the large mosque for Salat. A voice tells him that if he wishes his prayers to be accepted and if he wishes to have a connection with God he should go to the small mosque. He goes to the small mosque and sees his father sitting in there. He tells his son: this is the mosque of the Ahmadiyya Muslim Jama’at. If you want to have a connection with God, you should only come to this mosque for your Prayers. He says he did not know anything about the Jama’at prior to this dream so he asked people of the surrounding areas if there was an Ahmadiyya mosque around there. Someone pointed it out to him. The young man got in touch with our mu’allim (teacher/tutor) at the mosque and took his Bai’at. Huzoor said the main thing is sincerity and not majority. One should go where God’s grace is. Someone writes from Gambia that one night he saw a dream that a person comes to him and holds him hand firmly and says Assalamoalaikum warahatullah to him. He does not recognise the person and asks people who he is. People tell him that he is the Imam of the Ahmadiyya Jama’at. Next morning he went to our mission house and related the dream to our mu’allim. The mu’allim had MTA on which was broadcasting Huzoor’s Friday sermon at the time. When the guest saw Huzoor on MTA he remarked that this indeed was the person who had appeared in his dream the night before and he accepted Ahmadiyyat Islam. Niab Nazir Dawat Lillah writes from Qadian that a person called Lal Din saw a dream in which a deceased child tells him that four people will visit him and tell him about Islam. He was advised to accept what the visitors told him and to put it in practice. Nazir Sahib writes when they arrived at Lal Din’s house and gave him the message of Ahmadiyyat he told them that he had been informed of their visit through dream and he said he had been waiting for them. Following this Lal Din Sahib, his sons and the rest of his family took Bai’at. A new Ahmadi from a local Jama’at of Kyrgyzstan writes that once during Asr Salat he experienced a vision in which he heard the verse of Surah Yunus: ‘And Allah calls to the abode of peace, and guides whom He pleases to the straight path’ (10:26) in his right ear. He was then told that teachers from India will explain the commentary of the verse to him. This is when this condition went away and he was left amazed at what he had experienced. He says he did not even know about India at the time. Later, when he went to Russia for employment purposes he met people from India but did not have any religious discussions with them. Gradually he himself became aware of matters of faith and was introduced to Ahmadiyyat and joined it in 2012. He had understood the significance of the Quranic verse; people from India were going to be a source of guidance for him! Our missionary from the Maharashtra region of India writes that in a village of the area a woman called Sultana Begum was a fierce opponent of Ahmadiyyat. Her husband had accepted Ahmadiyyat and there was great upheaval in the family and there was fear they would get divorced. Her husband stayed firm on his belief and asked the Jama’at to advise her. Jama’at told her that her husband was on the truth and she should also pray God would show a miracle. However, she felt Ahmadiyyat would ruin her faith and although they had MTA at home, she watched other channels. God’s power manifested in a dream the lady had. She saw a holy person recites the Kalima and says that the Holy Qur’an is the final Shariah and it should be followed. She felt this holy person was the Holy Prophet (peace and blessings of Allah be on him). This dream did not convince her although she went quiet after seeing it. She has another dream in which she saw that Ahmadiyyat had spread all around their area and whoever she speaks to is an Ahmadi. She saw the kalima written on an egg yolk and it is also written that the Imam Mahdi has come! In the dream she says to her brother who is also an opponent of Ahmadiyyat that these people are truthful! Next morning she took Bai’at. Our mu’allim from the Koulikoro region of Mali writes that an elderly man from a village told him that he had seen a dream a long time ago that he is climbing a very high wall. Once he reaches up the wall he sees flowers and on the right side of the flowers are some people. He is told in the dream that if he wishes to learn about Islam and recognise the Holy Prophet (peace and blessings of Allah be on him) he should join those people. He did not understand what this meant. Now that he had started listening to Ahmadiyya radio he saw another dream in which he is told to join the people of Ahmadiyya radio and he will reach God. He accepted Ahmadiyyat after this. The responsibility of those of us who are born Ahmadis and long-term Ahmadis increases after we listen to accounts of those who are guided by God. We should keep an eye on our own condition and create a connection with God and correct our practices. We should always remember lest our indolence deprives us. It is God’s decree that Ahmadiyyat is going to move onwards and upwards, what we need to do is pay attention that we are also part of this onward progression. There are also accounts where people have issued Fatwas against us but God has caused those who seek these Fatwas themselves become targets of the edicts! An Ahmadi lady from Egypt writes that her father belongs to an Islamic organisation and follows it blindly. His organisation sought another Egyptian organisation to issue a Fatwa against Ahmadiyyat declaring it to be outside Islam. Once, her father made a false allegation against Ahmadis when their relatives were around. She felt very helpless and raised her hands in prayer and pleaded to God to support Ahmadiyyat with His grace and avenge those who spoke falsehood and claimed to speak the truth. While she was fasting in Shawal she switched on the TV and heard the news in amazement that Al Azhar had declared that very organisation (which had passed a Fatwa against us) to be outside of Islam. She said she raised a slogan of Allaho Akbar and said the Promised Messiah (on whom be peace) was indeed truthful. She told her father this was an answer for him in the form of a greater and more powerful Fatwa! Huzoor said this process continues to this day but some unfortunate people not only do not recognise the truth, they oppose it. May God soon show these opponents their ending and may Ahmadiyyat move onwards and upwards and may we always be a part of it. 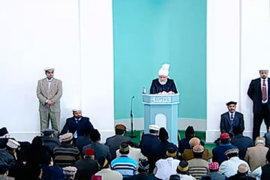 Next Huzoor announced that he would lead some funeral Prayers after Friday Prayers. Jamil Ahmad Sahib has lived in Germany for a long period. He came to the Jalsa Salana UK with his family. They had come in two cars. As they returned home one of their cars which was driven by his daughter had an accident near Lemburg during night time. In an effort to overtake them a car from behind collided with their car resulting in their car losing balance and pushed in the next lane. There it collided with oncoming traffic from the opposite direction. Jamil Ahmad Sahib’s wife Amatul Hameed Sahiba and two granddaughters one aged 11 and the other 10 died on the scene. Inna lillahe wa inna illahai raji’oon. Jamil Sahib’s daughter who was the wheel of the car which was involved in the accident and a grandson were severely injured and went into coma. With the grace of God they are better now. May God grant them complete healing. Ameen. Amatul Hameed Sahiba had served as a local Sadr Lajna for fifteen years. May God elevate the station of those deceased and grant steadfastness to the bereaved.